Breed: Anyone, who has met these unusual cats, immediately is asking the same question: "Where these cats came from?" In the name of this breed we can find half of the answer: from the county of Cornwall, although the first mention of curly cats we find in the book written by Karel Trojan, where he notes that in Moravia in 1936, there were already known such animals. But then in Czechoslovakia, they were considered sick and destroyed. Later, in 1946, cats with the curly short hair were also seen in Berlin, but at that time the German cat fanciers were not up to breeding. But in 1950, the curly cats finally were lucky: the first cat - a male of creme color, that was named Kallibanker - appeared in the south-west of Great Britain, on the farm, that is situated in the county of Cornwall, in the family of Ms. Ennismore, in a litter of five kittens, that was given by an ordinary tortoiseshell cat. He was the only curly kitten. Ms. Ennismore was engaged in breeding rabbits, and by the name of the curly breed of rabbits was named the new breed of cats - "Rex" ("Royal"). 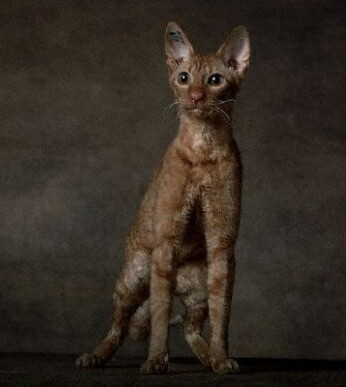 So Kallibanker became the first Cornish Rex. On the advice of a veterinarian to fix the gene of mutation he was crossed with his mother. In that litter were born two kittens with the curly hair and curly whiskers. These two babies and Kallibanker became the ancestors of the breed. To secure a line of Cornish Rex, as well as to improve the quality of the coats (some animals were born hairless), there was undertaken the purposeful interbreeding with the British Shorthair and the Burmese. Cornish Rex cats, whose history has slightly more than 50 years, were standardized in Great Britain and in the whole Europe in 1967. In 1983, the standards were revised according to the features of genotypes. FIFe recognized three breeds of Rex cats: Cornish, Devon and German. To save their unique inherent characteristics of the exterior, it was decided not to mix this three breeds of cats with each other. From England, Cornish Rex was exported to Europe, Australia, New Zealand and United States. 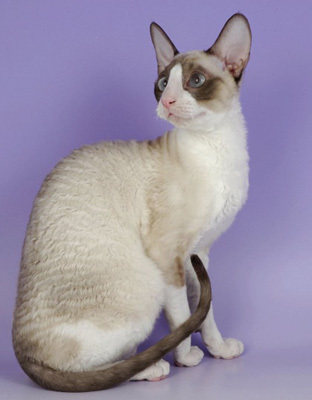 In New Zealand, by selection (directional cross-breeding with Siamese cats) there were obtained Cornish Rex cats of a Siamese color (si-rex). In the United States the Cornish Rex cats were bred since 1957, American breeders were emphasizing some certain points of the Cornish Rex exterior. Animals bred in the U.S. have become more high on their legs, their backs became even more curved, ears became bigger, straight nose of these cats became slightly hooked ("Roman profile"). Thus, the American Cornish Rex cats are somewhat modified comparing to the European ones. What is preferable - the future owner must decide himself, both types of the Cornish Rex cats are involved in breeding, they both have their fans and opponents. The first exhibition with the participation of only Rex cats was held in November 1980 in Kentucky. By this time the Cornish Rex won the hearts of many people, not only for his high intelligence. These cats are temperamental, independent, gentle, fearless, intelligent and very sociable animals. They are curious, as all cats, they are very affectionate with people, they understand their owner from his first glance. Like dogs, expressing their delight, Cornish Rex cats are wagging their tails. General Features: At any cat show Cornish Rex cats always cause surprise and a great interest from both: visitors, and exhibitors. And it is no wonder. These beautiful aristocratic cats are covered with the very special fur, twisted in tight curls. Cornish Rex does not have any guard hairs. Soft, plush, tightly curled coat of this cat gives the impression that they just came out of a barbershop. Cornish Rex is an elegant cat of medium size. The strong body of this cat is standing on the long legs, paws are small, delicate, oval in shape. Something in the body of a Cornish Rex reminds of the body of a fine Greyhound. Head of the Cornish Rex is in the form of a wedge - medium in length with a strong chin. The skull is flat, the length of the head is by one-third greater than it's width. Profile of a straight line from the middle of the forehead to the tip of the nose. Cornish Rex has a curly whiskers and eyebrows, ears, set high, broad at base, with rounded ends, covered with dense fine fur. Smart eyes, oval, of medium size. Eye color should be in harmony with the coat color. Paw pads and nose of a Cornish Rex cat should also be matching the coat color. The tail is relatively long. Temperament: Cornish Rex is a very elegant, glamorous cat. This breed is originating from the English county of Cornwall, where for the first time was assigned a "royal" mutation, the main hallmark of the breed Rex - wavy coat. Due to the absence of a guard hair, the short hair of Cornish Rex is very soft and warm to the touch, and "combed" into the natural relief curls, that are even slightly sining like pearls, and it is very difficult to resist the temptation to pet the "royal" coat. But the hair - is only one part of the remarkable appearance of the Cornish Rex. Fine bones, harmony, grace, long legs, elegant tail covered with the curly hair, elongated head with a straight profile and expressive eyes is crowned by the large ears. It would be wrong to think that the Cornish Rex - it's the same Oriental, but just a curly type. There are many other important differences: ears of a Cornish Rex are set higher, shape of the eyes is different, head shape is different... Overall, the appearance of a Cornish Rex is not "predatory", but rather "civilized" - not "the king of beasts," but "the enchanted prince" from a fairy tale. Cornish Rex is probably one the most easy breeds. Most of those, who have this cat in the house, notice the fact that of all the cats only Cornish Rex does not cause allergies in humans (or at least he is much less allergenic, than the rest of cat breeds). He does not sweat, like the hairless cats, and does not shed. All Cornish Rex owners agree in one thing: they had never seen the fur of this cat on their belongings, clothes, furniture ... These animals are endowed with a very good immunity, and above all that, they are quite undemanding and unpretentious. Cornish Rex is a true "professor" in the world of cats. These cats are very intelligent, smart and very much attached to the owner, but not to the house in which they live. This is not a cat, which "walks by itself", the Cornish Rex needs you and your love. And the representatives of the original pure strain of this breed possess some special nobility and aristocracy of behavior: Cornish Rex males do not mark territory, they are able not to pull off anything from the table, they do not annoyingly demand attention, and they let kittens to eat first, patiently waiting for their own turn to have a meal. Cornish Rex cats are not vindictive, they never show any aggressive behavior. This cat breed is quite easy to train: the Cornish Rex brings a thrown ball like a dog, learns to walk on a leash ... Some owners take their pets everywhere with them, because, having a certain amount of habit, Cornish Rex ensures the correct behavior in almost any situation. When Cornish Rex is asking for some attention, he is never tiresome, but very touching and sweet, so that your heart melts, and the "good curly King" or "Queen" is becoming your real forever joy in this life. At any cat show Cornish Rex cats always cause surprise and a great interest from both: visitors, and exhibitors. And it is no wonder. These beautiful aristocratic cats are covered with the very special fur, twisted in tight curls. Cornish Rex does not have any guard hairs. Soft, plush, tightly curled coat of this cat gives the impression that they just came out of a barbershop.